James E. Meadows, according to the Meadows family, was the second of five sons born to James Meadows, Sr., the English Marine artist. His brothers were Edwin Lewis (landscape artist), Alfred John (artist, actor and scene painter), William (artist and sculptor), and Arthur Joseph Meadows (artist specializing in Venetian and Mediterranean scenes). Currently research is being conducted by the family on the lives of the British Victorian artists. 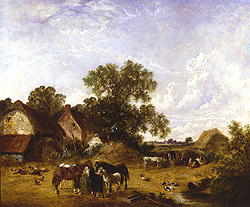 James was born in Mountnessing in Essex in 1826 and like some of the member of his family, turned to rural landscape painting. He lived and worked in the London area from the early 1850s through the late 1870s where his addresses included 5 Lansdown Villas, Staines Rd., Hounslow; 16 Malvern Villas, Hounslow and Gainsboro' House, Aldine St., Shepherds Bush. Meadow's paintings are often of beautiful sunlit views of the countryside in and around Kent, Surrey and Essex. 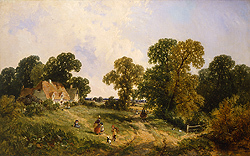 His favorite motif was a group of figures on a country lane with a cottage in the distance. His idealized rustic settings are composed of natural tones and light touches of soft pastel colors. 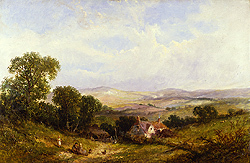 Meadow's landscapes were held in high regard during his lifetime and he was invited to exhibit at Walker Art, Liverpool; Manchester City Art Gallery; and several major art institutions throughout London, including, the Royal Academy; the British Institution; the Royal Hiberian Academy and the Royal Society of British Artists (1853-1875).